It's so exciting to watch the mail. More post cards have arrived one from the UK, one from Sweden and the others from around the USA. 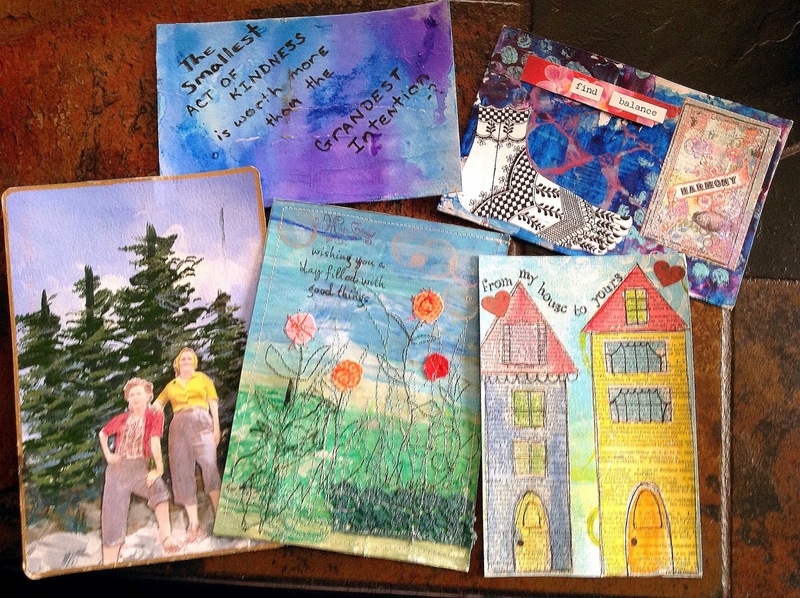 We all have been participating in ihanna's annual postcard swap. 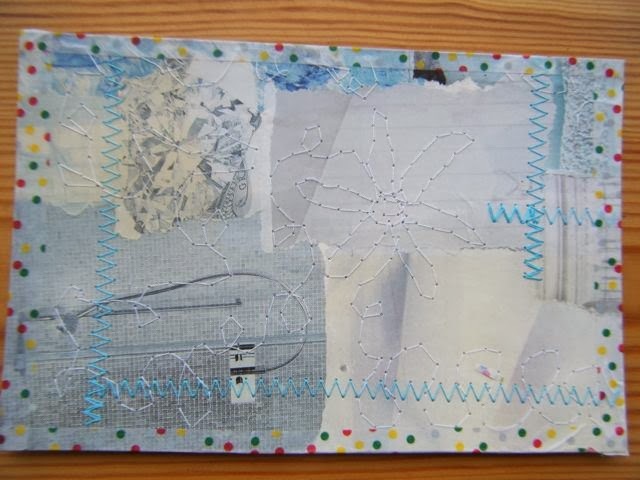 This one is from Sandra in the UK, a wintry feel to her card. Four of these cards came in one day. What an awesome find in my mail box. The blue and purple card on the top is made by Nancy from the desert area of California. To the right of Nancy is a little balance and harmony from Rachel in Florida. Below Rachel is a cute little card from Lorie in Phoenix. To the left of Lorie is a stitched card from Yvonne in Sweden. The last card to the left with the hikers is from Stephanie in Astoria, NY. 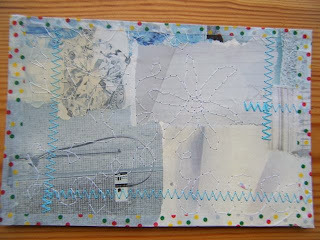 Each card is so unique, lots of collage and stitches. I must try some stitching on mine next time. If my count is right I should have just 2 more cards coming. Sorry I couldn't post a link to each sender but most only gave me an email address. Busy week, getting ready for Thanksgiving. At least I don't have to cook the turkey. One thing nice about getting older is now it's the kids turn to have the dinners. Besides they have much more room for gatherings then I do any more. And if I stick to my plan, after the first of the year I hope to sell my house and move to a rental, condo or apartment. One less responsibility to worry about. Beautiful cards, Cyndee!! Thanks for your lovely comment - yes, it's an awesome space. My major frustration at the moment is that I am too busy (and then too tired) to get in there and start creating!! They are all pieces of art! So beautiful!